Back in 2013 it as decided to start a new Pedigree Red Aberdeen Angus herd. This would be a joint venture between Owen Farms and Ricardo Truffer (Ricky), a vet and cattle farmer from Argentina, George would then look after them. This would be as far as we know the first stock brought from Argentina since the Falklands War and would be completely new genetics to the UK, we would also join the very few breeders who focus solely on Red Aberdeen Angus cattle. And so the process of getting embryos from Argentina to the UK began. Ricky picked out some of his best females from the Trumil herd and put them to some very good Canadian bulls and started flushing these to gather embryos whilst George started to look into who would make good recipients. The plan was to have the first embryos in the UK ready for implanting in June 2014, unfortunately due to the amount of paperwork required this did not happen and it was decided that Ricky would collect more embryos and we would make sure they were in the UK ready for implanting in June 2015. In early 2015 it was decided to buy a new bull for the commercial herd in George's care and the decision was made to purchase a pedigree Red Aberdeen Angus, he could be used on all the young cattle giving them an easy calving but would also be available in the future to use in the new pedigree herd. 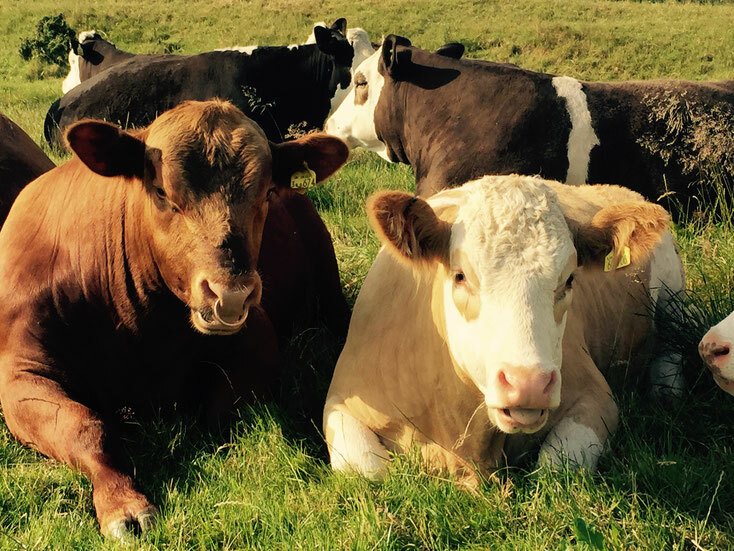 A trip was made by George and Tanya along with Jackie Owen to the Hawkley herd in Hampshire, a lovely herd of Red Angus cattle owned by the Whitcombe family and the decision was made to buy Hawley Red Romeo. He arrived at Red Oak Farm in April 2015. Ricky had at this point collected over 40 embryos but the paperwork side of things was still causing much concern. At the beginning of May 2015 it was decided that only 29 could be exported and they were then sent to the shipping agent in Argentina. At this point George thought things were all OK so he start to think about getting the recipient heifers ready, on the 21st May the synchronisation process started and on the 22nd May George found out that the paperwork was wrong and the embryos would not be realised from Heathrow Airport. The following week was a bit frantic, not helped by George trying to get a few days away. After many phone calls a new set of paperwork arrived on the 29th and we thought great, the vet was with George and all the recipients received their final injection in the synchronisation process; there was no turning back now! Just as they had finished injecting the heifers George had a phone call to tell him that the new paperwork had also been rejected by the vets at Heathrow. After yet more frantic phone calls and a very sensible conversation with the chief vet at Heathrow things finally got sorted and George collected the embryos from Heathrow on the 30th. Implanting the first embryo - Ricardo Truffer and Katie Goodfellow of Towcester Farm Vets. 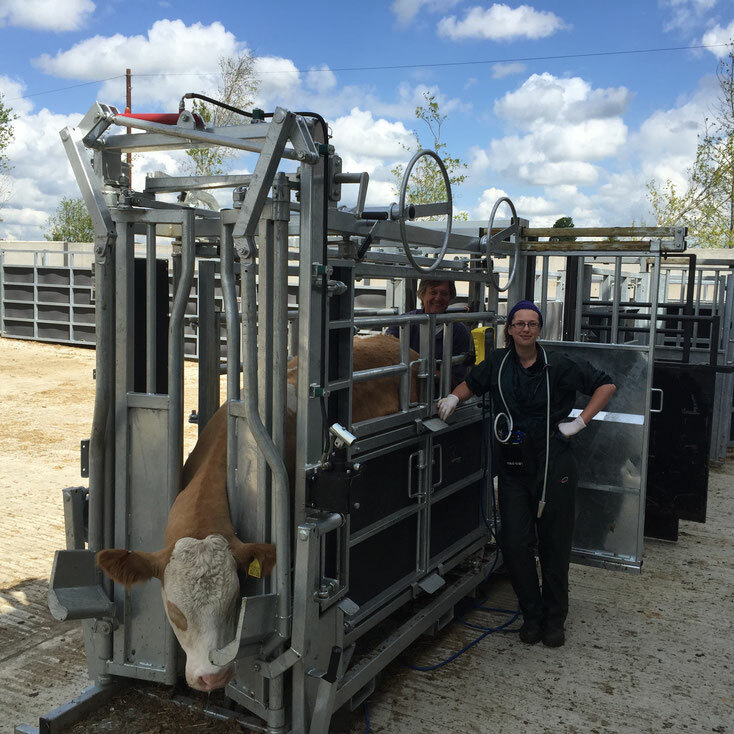 On the 8th June 2015 we implanted 14 embryos into some of our heifers. 7 were confirmed in calf at scanning although unfortunately only 5 of these made it though to calving. 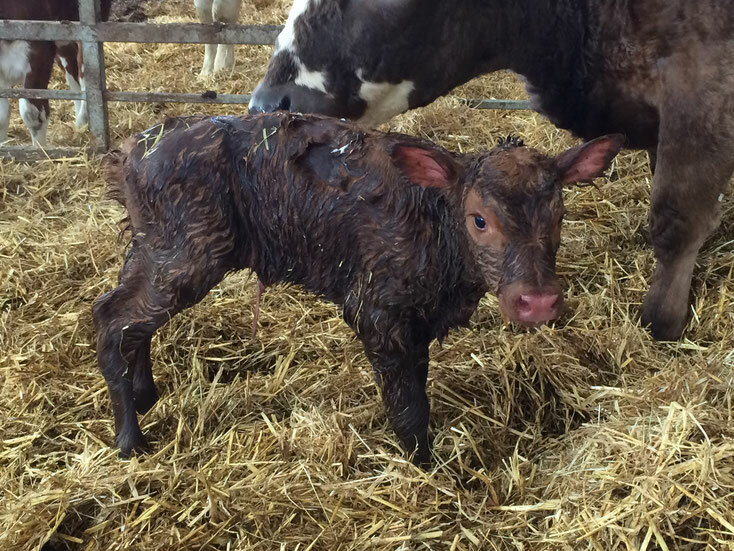 On the 5th March 2016 the first calf was born, in all that year we had three heifers and two bulls. On the 1st February 2016 we implanted another 4 embryos, 2 off these were confirmed in calf at scanning but unfortunately neither of these made it to calving. In June 2016 we implanted another 6 embryos with 4 off these holding in calf, all 4 also made it to calving and were born in February/March 2017. The first calf born - first animal imported from Argentina since the Falklands War. The last of the embryos in storage will be implanted in June 2017, the first heifers born back in 2016 will also be artificially inseminated in June to a Red Angus bull and then they will run with Romeo to guarantee they are in calf. All of these should then calve in March 2018.